James, the brother of Jesus and writer of the epistle of James, was not an apostle. He delivered the coup-de-grace to the Judaism argument with a direct appeal to the Word of God. God had already spoken on the matter! Quoting Amos 9v11-12, James reminded them that the prophet had declared that 'David's fallen tent' was be restored and that this would involve the in gathering of all the Gentiles who bear the Lord's name' (Acts 15v16-18). This is fulfilled, James says, in all that Peter had described (Acts 15:14). The church of Jesus Christ was all along intended to encompass both Jew and Gentile and, one by one without discrimination, they are brought to the same faith by the same Lord. The gospel is for all nations. This, James showed, was 'the mind of God", in the Scripture'. The first was the definitive doctrinal answer to the Judaizers, which stands for all time: 'We should not make it difficult for the Gentiles who are turning to God' (Acts 15v19). This verse is often passed over as a mere introit to the verses that follow, but it ought to be seen as standing on its own. It told the Judaizing party in the gentlest possible way - if they thought through all they had heard - that what they were asking for was not the Lord's will for the church, but was, indeed, even contrary to the gospel of God's free grace in Christ and wonderful doctrine of being put right with God by faith alone. If ever them was a soft answer that would turn away potential anger, this was it. 'We should not make it difficult,' is an example of affirming a basic doctrine in a very practical way. The doctrine had been clearly stated by the previous speakers. There was no need for a bare restatement. There was need, however, to persuade people of its practical significance. And, at the same time, those whose views were being rejected needed to know that they were not being personally rejected, but were still warmly embraced within the fellowship of the Lord's people. They were believers and they had laid their views before the whole church in an orderly manner. Having received the considered judgement of the church, they could be expected to receive it with due submission in the Lord. They were certainly not to be made to feel that they had been foolish or were no longer welcome. This is surely a model for resolving doctrinal and practical controversy today. Too often, church debates degenerate into fights and lead to unnecessary and ungodly division. The maintenance or truth never requires discourtesy or unpleasantness on the part of its advocates, even if those who oppose it are strident and contentious (2 Timothy 2v25). James deftly set the denial of any requirement of legal observances for salvation (the other side of which was the affirmation of the doctrine of salvation by grace alone through faith in Christ, in terms of not putting difficulties (that is unbiblical ones) in the way of Gentile converts being received into the membership of the church. 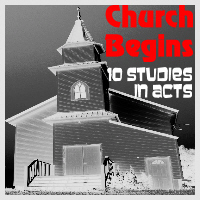 The second part is a practical four-point proposal (Acts 15v20) designed to foster unity in the church. They proposed asking the Gentile Christians to take particular care to distance themselves from their former manner of life. This was also, no doubt, designed to allay the fears of Jewish Christians, whose sense of what constituted a God honouring lifestyle was formed by the regulations of the law of Moses. They needed to know that Gentile Christians were not adrift from practical godliness as properly defined by God's Word. James therefore addressed specific practical issues, where the teaching of the Scriptures - still confined to the Old Testament - challenged the accepted norms of Gentile behaviour and called for a conscientious application of biblical principles. First, they should 'abstain from food polluted by idols' (Daniel 1v8; Malachiv1:7-12). This had been offered at pagan temples as sacrifices to the gods and the surplus sold in the market. The question here was not primarily one of diet - that is dealt with in the third and fourth points - but concerned association with the milieu from which the food had come. Questions of conscience later arose in Corinth on this very point. These were addressed by Paul, who made it clear that while there was no essential problem with eating this meat, there ought to be sensitivity to the tender consciences of those who, having come out of paganism, regarded consuming it as a sinful complicity with paganism (1 Corinthians 8v1-13; 10v14-33). Second, they should abstain from 'sexual immorality' (Leviticus 18; Matthew 5v27-30). The Gentile world, like that of television movies and sitcoms today, treated promiscuous sexual relations as acceptable and part of normal behaviour. This was sin then and it remains sin to this day. Third, they should not eat of 'the meat of strangled animals'. This is a reference to meat from which the blood had not been completely strained (Leviticus 7v22-27).' Lastly, they should eat no 'blood' (Genesis 9v4; Leviticus 17v10-12; 19v26). This was the basis for the preceding point. Blood was symbolic of life and was to be reserved for sacrifice to the Lord, thus underscoring his role as the giver of life. None of these, as John Owen points out, was a new imposition on the practice of the churches.' All were clearly taught in Scripture, even if all but the second were elements of old covenant piety that would eventually pass away when the full revelation of the New Testament was completed. The purpose of reiterating them here was to encourage a discerning sensitivity to practical godliness in a Gentile social-cultural milieu and a Jewish Christian ecclesiastical context. Gentiles were to examine critically their old habits and give no cause to anyone to accuse them of their old sins. They were also encouraged to be graciously accommodating to Jewish dietary sensitivities. For their part, Jewish believers needed to understand that Gentiles were not to be required to observe the Mosaic ceremonial law, now that the Messiah had come and published the gospel of sovereign grace in all its fullness. The decision was made to adopt James' proposal and send a letter with a deputation to all the churches in 'Antioch, Syria and Cilicia' (Acts 15v22-29). This conveyed the verdict of the council. Today it still vibrates with lively applicability. First of all, the men who insisted on circumcision and the law were declared to be 'without the church's authorisation' for their disturbing teaching. This almost unobtrusive dismissal underscores the solidity with which the church knew its doctrine. From the beginning, the apostles clearly taught that salvation was by the free and sovereign grace of God through faith in Christ and not through man's best efforts to keep tile law and impress God with self generated good works. Jerusalem held that line and closed the door to works-righteousness- Good works have a vital place in the Christian life, to be sure. They are, however, not the root, but the fruit of salvation, prepared by God in advance for us to do (Ephesians. 2v10). They emphasised that the decision 'seemed good to the Holy Spirit and to [the church I' (Acts 15v28). Here is the purpose and the role of the church in the guidance and discipline of God's people. Jesus had promised that the Holy Spirit would lead them into all truth (John 14v26; 16v13). All decisions in churches, as well as in the individual Christian's life, ought to fulfil this condition. Not only does it tell us what God does with his church, but it defines the goal and prayer of the church. If what we do only seems good to us, without the evident leading of the Spirit, then we are simply not doing the Lord's work. The council's four 'requirements' - one permanent (sexual immorality), the others transitional and temporary, highlight the necessity and the blessing of the separated life for Christians: 'You will do well to avoid these things' (Acts 15v29). Christians must bear a decisive testimony to the society in which they are located - a testimony which shows the righteousness of God before the world. The result in the mission churches was encouragement and continued blessing through the ministries of Judas, Silas Paul and Barnabas (Acts 15v30-35). The burden of Judaistic legalism was lifted. The Gospel of Jesus Christ 's was lifted up before the Gentiles and the Holy Spirit continued to accompany the preaching of the Word with power, so that more and more people were being saved by grace alone, through faith alone in Christ alone.